The frame of a chart is the area that contains the plot points. It is also the area in which horizontal and vertical gridlines are drawn. The background of a chart is the area around the frame. You can adjust the appearance of the frame and background to achieve different visual effects for your charts. For example, you can change the appearance of the chart frame line, or you can change the color of the background of your chart. Note: The options in the Frame tab vary based on the chart type selected. Use the Frame tab for 2D charts and 2D charts with 3D effects to set a frame depth angle and depth radius, select a fill for a frame, and set a shadow for a frame for these types of charts. The Frame tab for 2D charts and 2D charts with 3D effects is shown in the following image. Depth Angle. Enter the angle from the front of the chart to the back where the chart risers and frames are drawn. You can set the depth angle from zero to 180 degrees, but it must be used along with Depth Radius. Depth Radius. Enter how far out the extruded frame will be extended. Small values, such as zero, produce very narrow charts. Large values, the maximum being 100, produce thicker charts. No fill. (Default). Select this option to keep the legend colorless. Color. Click this icon to open the Color dialog box, where you can select a color for a frame. Transparency. Move the slider to make the frame opaque (0%) or transparent (100%). The default is 0%. Color Pattern. Select the color pattern for the data series. The color pattern option on the left is an AB wash that uses two colors in the pattern color1 - color2, for example, red-green. The color pattern option on the right is an ABA wash that uses two colors in the pattern color1 - color2 - color1, for example, red-green-red. First Color. Click this icon to open the Color dialog box, where you can select a color for the first color. Second Color. Click this icon to open the Color dialog box, where you can select a color for the second color. Show Shadow. Select this option to set a shadow. Use the Frame Edge tab for 2D charts and 2D charts with 3D effects to set a frame depth angle and depth radius, select a fill for a frame, and set a shadow for a frame for these types of charts. The Frame Edge tab is shown in the following image. Automatically Shade Frame Edge. 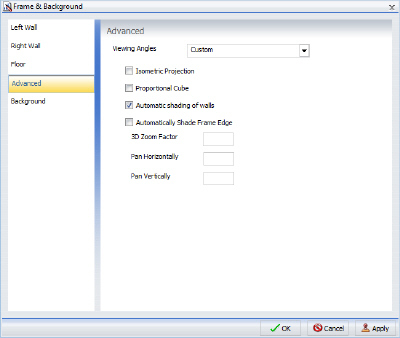 Select this option to automatically shade the frame edge. Clear this option to enable the Side Frame and Bottom Frame options. Show Color. Select this option to show the color of the side frame. Color. Click this icon to open the Color dialog box, where you can select a color for the side frame. Show Border Color. Select this option to show the color of the border of the side frame. Border Color. Click this icon to open the Color dialog box, where you can select a color for the border of the side frame. Show Color. Select this option to show the color of the bottom frame. Color. Click this icon to open the Color dialog box, where you can select a color for the bottom frame. Show Border Color. Select this option to show the color of the bottom frame. Border Color. Click this icon to open the Color dialog box, where you can select a color for the border of the bottom frame. Use the Frame tab for pie charts to set pie depth and tilt, select a fill and color for a pie frame, and set a shadow for the frame. The Frame tab is shown in the following image. Pie Depth. Set the depth of the edge of a pie chart. You can select a value from zero to 100 to set the thickness of an edge. Pie Tilt. Set the tilt of the pie chart. The smaller the value you add, the flatter the pie chart appears. The larger the value you add, more of the pie edge appears. No fill. (Default). Results in no color added to the edge of the pie. Color. Click this icon to open the Color dialog box, where you can select a color for the frame. Transparency. Move the slider to make the fill opaque (0%) or transparent (100%). The default is 0%. Show Shadow. Select this option to set a shadow around the frame. Use the Frame Edge tab for pie charts to set the edge of a pie frame. The Frame Edge tab is shown in the following image. Color. Click this icon to open the Color dialog box, where you can select a color for side frame. Use Wall and Floor tabs to set the walls and floor of a 3D chart. The Left Wall tab is shown in the following image. Show Wall or Show Floor. Select this option to show the wall or floor (depending on the tab) of the 3D chart. Wall Thickness. Specify the thickness of the wall or floor. Cube Size. Specify the cube size of the wall or floor. Color. Click this icon to open the Color dialog box, where you can select a color for the wall or floor. Border Color. Click this icon to open the Color dialog box, where you can select a color for the border of the wall or floor. Show Wall (Left Wall). Select this option to show the left wall. Show Wall (Right Wall). Select this option to show the right wall. Show Floor. Select this option to show the floor. Use the Advanced tab for 3D charts to modify additional properties for 3D frames. The Advanced tab for 3D charts is shown in the following image. Isometric Projection. Select this option to ignore perspective distortion in a project graph cube from an isometric view. Proportional Cube. Select this option to define the axis size proportional to the number of series or groups. Automatic shading of walls. Select this option to shade chart walls. Automatically Shade Frame Edge. 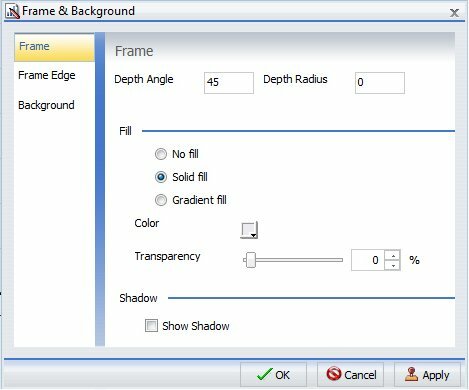 Select this option to automatically shade the frame edge. 3D Zoom Factor. Enter a value in the text box to set the global scaling factor for zooming in and out in a 3D chart. Smaller values zoom out and produce a smaller display of the chart within a frame. Larger values zoom in and produce a larger display of the chart within a frame. Pan Horizontally. Enter a value in the text box to pan a 3D chart in the horizontal direction. Smaller values move the frame of the chart to the left. Larger values move the frame of the chart to the right. Pan Vertically. Enter a value in the text box to pan a 3D chart in the vertical direction. Smaller values move the frame of the chart upward. Larger values move the frame of the chart downward. Use the Background tab to set and customize a border for a chart. The Background tab is shown in the following image. Show Border Color. Select this option to show the color of the border. Transparency. Move the slider to make the background opaque (0%) or transparent (100%). The default is 0%. For instructions on how to open this dialog box, see the procedures in Using Frame and Background Properties. When you right-click a chart background, a menu of options opens. The options for the background and frame elements are described in the following table. Enables you to specify the color of the background, using the Color dialog box. For instructions, How to Change the Color of the Background. Controls the display of the legend on the background. When selected, it displays the legend. When cleared, it suppresses the display of the legend. Opens the Frame & Background dialog box. For more information, see Frame & Background Dialog Box. Enables you to specify the color of the frame, using the Color dialog box. For more information, see Color Dialog Box. Controls the depth of the frame. The value On renders the frame in 3D depth. The value Off renders the frame in one dimension. For instructions, see How to Set 3D Depth on a Bar Chart. The following sections contain procedures for customizing frame and background properties. The options for the following procedures are found in the Features group of the Format tab. The default color of the frame in a chart is determined by the Document Theme selected on the Options window. For more information, see Changing User Preferences. The following image shows a chart with the default frame color. This procedure describes how to change the color of the frame. Ribbon: On the Format tab, in the Features group, click Frame & Background. Right-Click Menu: Right-click the chart, and select More Frame & Background Options. The Frame & Background dialog box opens. On the Frame tab, in the Fill area, click the Color icon. Note: Solid fill must be selected for the Color icon to appear. The Color dialog box opens. Select a new color for the frame. For more information on the Color dialog box, see Color Dialog Box. You can also set the depth angle and depth radius for the frame, as well as set a shadow for the frame. The chart displays the new frame color. The following image shows the same chart with a new frame color. The default color of the background of a chart is determined by the Document Theme selected on the Options window. For more information, see Changing User Preferences. The following image shows a chart with the default background color. Right-Click Menu: Right-click the background of the chart, and select Background Color. On the Background tab, in the Fill area, click the Color icon. The Color dialog box opens. Select a new color for the background. For more information on the Color dialog box, see Color Dialog Box. The chart displays the new background color. In the following image, the chart now has a background color.